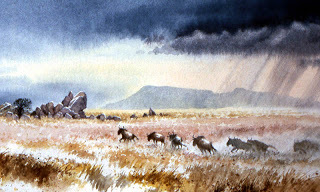 This entry was posted in Adventures with wildlife, Animals in landscape painting, composition, David Bellamy, sketching animals, sketching outdoors, substituting detail in painting, Uncategorized and tagged #paintinganimals, #saunderswaterfordwatercolour, #sketchingwildlife, #stcuthbertsmill, #watercolourdemonstration by David Bellamy. Bookmark the permalink. I would have come running to your talk, if it hadn’t been so far away and at a very busy time for me – unfortunately labour-related and not pleasure. I wish you every success and a very pleasant evening to you, Jenny and these lucky people of Yorkshire.